Get ready to roll out with the highly popular feature-length epilogue to Hasbro Studio’s Emmy Award-winning series Transformers Prime on a variety of digital entertainment platforms in North America. 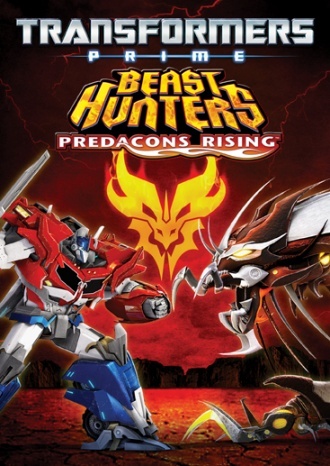 Today Transformers Prime Beast Hunters: Predacons Rising is now available for rental or purchase on iTunes, VUDU, CinemaNow, Google Play, Rovi, Sony PlayStation Network and Xbox, as well as available through Amazon Instant Video on April 1. Brimming with spectacular CG animation, a captivating storyline and unforgettable characters from the Transformers Prime lore, Transformers Prime Beast Hunters: Predacons Rising delivers entertaining cinematic adventure the whole family will enjoy. A resurrected Unicron has taken over the now-lifeless body of Megatron to seek vengeance on the Autobots and ultimately, the destruction of Cybertron. This formidable enemy forces an unlikely alliance between the Autobots , Decepticons, Predaking and two new Predacons, who come together in an epic battle to help protect their newly restored planet. Peter Cullen, Frank Welker, Josh Keaton, Jeffrey Combs, Kevin Michael Richardson, Steve Blum, Will Friedle and Sumalee Montano lend their voices to this hit series produced by Hasbro Studios. Spearheading the creative efforts on TRANSFORMERS PRIME are executive producers Jeff Kline, Alex Kurtzman, Roberto Orci, Duane Capizzi and Stephen Davis. Transformers Prime Beast Hunters: Predacons Rising is also available now on Blu-ray™ + DVD combo pack and on DVD from Shout! Factory.